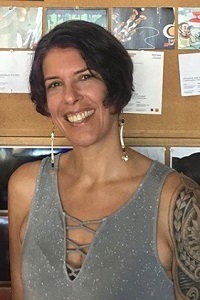 Michelle Lee Brown is a Ph.D. candidate studying Indigenous political praxis and futures through Indigenous designers’ video games, graphic novels, and machinima. She has published peer-reviewed work on the Never Alone video game, a methods chapter on Indigenous political theory approaches to videogame research, and “Liminal” – a comic in the forthcoming Relational Constellation collection from MSU Press and Native Realities Press. She is currently working on a VR project on water and relationality, and a comic based on multiple levels of impostor syndrome. Euskaldun, her ancestral land and waters are Lapurdi, the Bidart/Plage DʻErretegia area – but she grew up on Wampanoag territories around Buzzards Bay, Cape Cod, MA. Michelle currently resides on, and is nourished by, the lands and waters of the Kānaka Maoli in Honolulu, Hawaiʻi. She strives to uphold her relational commitments to these communities, and is grateful to be working on the project. A website for the Skins 6.0 Workshop on Aboriginal Storytelling and Video Game Design, held at Hālau ‘Īnana in Honolulu, 9 July – 29 July, 2018.